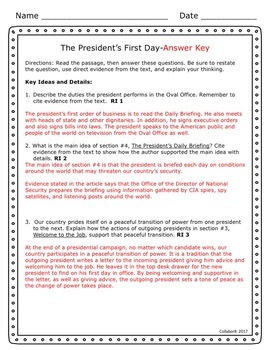 Have your students ever wondered what happens the morning a newly-elected president wakes up in his bed in the White House on his very first day in office? How does the president order breakfast? How does he find out what is going on around the world? What happens if he needs to leave the White House? Who protects him? 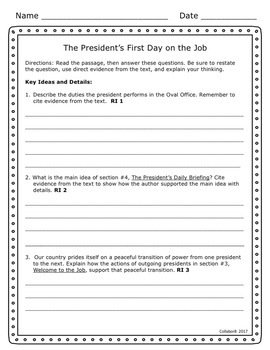 Students will follow the president through his first full day in office and learn what a typical day for a newly-elected president is like. 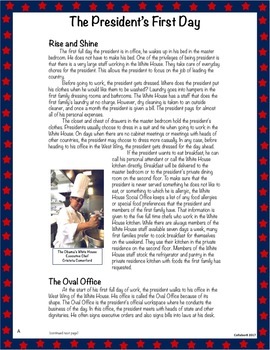 Topics include: ordering breakfast, the daily security briefing, welcoming letter from the outgoing president, conducting business in the Oval Office, riding in a presidential motorcade, and Secret Service protection. Students will conduct a close read on the 4-page article and then answer text dependent questions. 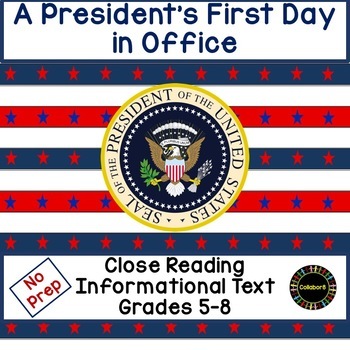 In addition, they will read two letters from outgoing presidents to incoming presidents and analyze the content.